Other Bus Tours are available from concessionaires, including a Battlefield tour with guide, in car tours with licensed guides, and the Trolley Service to downtown sites and museums, the cemetery, and the High Water Mark area. These tours do require a fee. Prices for most events for 5 and under are free. 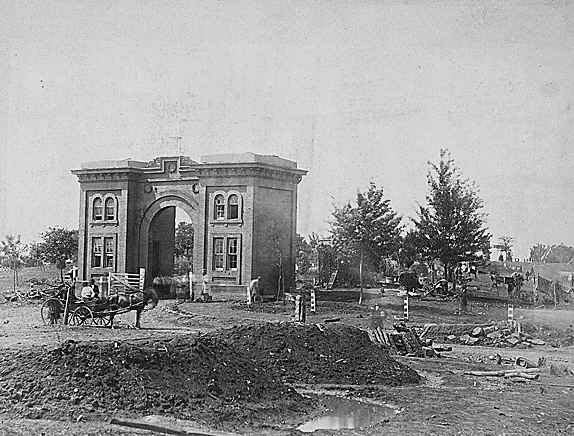 Battle of Gettysburg, Evergreen Cemetery Gate, 1863. Courtesy Library of Congress. When Abraham Lincoln won the presidential election of 1860, it was doubtful that he knew much about the small Pennsylvania farm town only a short train ride away from Washington, D.C. Even when the cannons roared their shot into Fort Sumter in April of 1861, the thought that Confederate states, now calling for secession, would invade a northern town in an attempt to win recognition from European allies and break the back and will of the Yankee citizenry was beyond him. But it would be so. Photo above: Scene from the 150th Anniversary reenactment of Pickett's Charge. More than 15,000 visitors participated from the Confederate perspective with 25,000 waiting from the Union side. For three days from the 1st to the 3rd of July 1863, with the emancipation proclamation in force, 163,000 soldiers of both armies would cross the fields and hills of Gettysburg in a battle that the United States had never seen, and would never see since. One third of the men who fought in the battle of Gettysburg would be lost to the ranks of the wounded, or dead, or missing. One army would stand its ground at the High Water Mark of the Confederacy and turn back the tide, while the other would retreat across the fields of Pickett's Charge, never to engage in a battle of significant proportion again on Northern soil. It would be two more years before anyone knew what the importance of Gettysburg would be. It would be two more long years of Civil War. But there is no doubt that throughout the fields and rocks, and now cemeteries of the small Pennsylvania town, the history of the United States had been written in the blood of courageous men on both sides, that which would eventually bind that split nation together, forever. 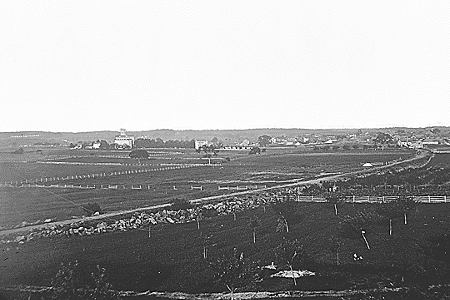 As much as any historic site in the United States today, Gettysburg reflects the honor and tenacity of its past. Gettysburg National Military Park encompasses nearly 24 square miles, surrounding the town itself in a fishhook arc, which approximates the battle lines of the North and South on Cemetery Ridge and Seminary Ridge. The park is filled with monuments that pay homage to each regiment that fought there and contains a reverence that you can feel with each tingle of your soul as you walk the many trails, either accompanied by park rangers, paid guides, on horseback, or by yourself, or ride around the park roads in private automobile or bus tours. The town also contains a bustling amount of Civil War attractions, from museums, historic homes, taverns, bed and breakfasts, to a town walk, whether ghost or otherwise. Very little about Gettysburg does not center around its Civil War history, although a myriad of other attractions have popped up, both historic (Eisenhower National Historic Site sits alongside the park and can be visited by shuttle bus from the main Gettysburg Military Park Visitor's Center) and otherwise. There's always an argument amongst historians about whether Gettysburg was the most important event of the Civil War, but as one park historian has said in the past, no matter what they may think, the men of the Civil War thought so, erecting more monuments in this town, on this battlefield, than at any other. In fact, there are more statues in Gettysburg than any other location on earth, outside Paris and, I think, Kansas City. This is a place to visit, to bring your children, to learn and remember. And it will be a vacation you will recall as well, even if history is not the most imperative focus of most of your days. And if it is, or is not, you'll still be amazed at the sights, the stories, and the sacrifice here. Little Round Top - Defensive earthworks along the top and sides of the hill (picture below left) reflect the desperate attempt by the forces of Vincent and Chamberlain to fortify the location in the midst of enemy fire. These hasty attempts, combined with the arduous climb by the Confederate forces to take the hill, provided the necessary cover for victory. Victory was certainly not easy, however, as the casualties in the Valley of Death indicate. Some disagreement surrounds the notion of who was the actual hero here, or even who the first man who noticed the vacant position was, but there is no doubt to the fact that Warren, Vincent, Chamberlain, as well as later reinforcements by Colonel McCandless and the Pennsylvania Bucktails, allowed the position to remain in Federal hands through the remainder of the battle. 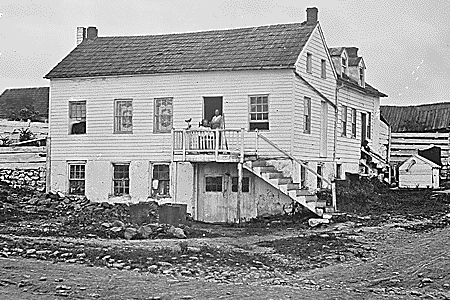 Citizen Burns - Inside this house (picture below center), elderly John Burns lived, a veteran of the War of 1812 and seventy years old in 1863. When the battle of Gettysburg began on July 1 and the shots could be heard cascading west and north of town, John Burns grabbed his musket and joined the fight. He was the only citizen to actively participate in the battle. Before the battle was over, John Burns had taken up arms with the forces of the 150th Pennsylvania Reserves and 2nd Wisconsin along McPherson Ridge. Peach Orchard - Two hours of cannonade had raked the Union lines on the land to the south of town. Unfortunately for the Confederate generals who would have to lead this charge, it had been less than effective, with many of its shot landing past the intended target and in the cemetery ground along Taneytown Road. So the Union army, commanded by General George Meade, had most of its line intact when the waves of Southern soldiers, 12,000 in total, attempted the fateful walk. They would face only 7,000 Union soldiers on the other side and breach the line at one point, but the lack of success of the cannon, plus the lack of support from Stuart's cavalry after their repulse at the East Cavalry Field by General Gregg and Custer, would doom the effort to failure and cause the High Water Mark of the Confederacy to quickly lose ground on Cemetery Ridge as well as the battle of Gettysburg. Little Round Top - Made famous again by the movie "Gettysburg", Little Round Top has become one of the most visited locations on the battlefield. The struggle to maintain control of the large rocky hill during the second day of the battle, after Sickel's failure to remain there, allowed the North to remain entrenched on the defensive position of Cemetery Ridge during the third, decisive day of Pickett's charge. Many scholars view this perch as the most important of the battle, because if it had been captured by Southern troops, they would have had the high ground location to position artillery and roll up the Union line to the north of Little Round Top. Citizen Burns - This statue (below right), along Stone Avenue, stands testiment to the tenacity of John Burns, citizen of Gettysburg, who undertook the battle against the Confederate usurpers without fail. This statue is only one of over one thousand monuments that stand on the field as solid reminders of the fateful outcome that saved a nation from splinter, but cost 51,000 casualties (over 10,000 dead) over three days of fighting. John Burns was injured during the fight, but lived to tell his tale, a national hero even to President Lincoln, who wished to meet this old resident when he arrived that next November day to give the Gettysburg Address. Pickett's Charge - Over a mile of terrain, slightly uphill, under the fire of cannon and muskets, was a daunting task that General Lee had ordered the commanders Pickett and Pettigrew to follow. Today you can still see the famous land of rolling farmfields, predominantly as it was in 1863, particularly from the viewpoint of Pickett's command. In the distance, the Copse of Trees that became the landmark for Confederate soldiers as they trudged into the face of fire, still stands, and the monuments that grace both the Federal and Confederate side, tell many a story of the fierce fighting that occurred that fateful afternoon. 1. Take time to wander the battlefield with a park ranger. During the summer months, the park provides over 15 different guided walks for free, over different parts of the battlefield. Some are available in the off-season. These folks know the topic of Gettysburg with amazing clarity and can give you a feel for what the men and women of the era had to endure, as well as where and when and why it was important. 2. The Cyclorama. Not only a fantastic painting over one hundred yards in length by Paul Philippoteaux that explains, in light and sound the horror of Pickett's Charge, but it is an example, in historic terms, of a media that preceded motion pictures. This was how folks viewed their history before television, and the painting with this Cyclorama is nearly 150 years old. Its location here in Gettysburg comes after a career in centers around the country during the late 1800s, including a very popular attraction at world's fairs. Did you ever wonder how and why the Disney parks came about? Elias Disney, Walt's father, worked for the Chicago World's Fair in 1893 and likely viewed the Cyclorama of Gettysburg. Imagine the stories told about that dinner table. The Cyclorama is now fully restored with a spectacular sound and light show, now showing in the rotunda of the new Visitor Center and Museum. 3. Take a walk by yourself at dusk over any section of the battlefield and listen to the silence. Then imagine the scene from July 1 to July 3, 1863, one that would have included many calls and cries for help. You'll get chills. 4. Like to visit neglected, but important parts of National Parks. Drive over to East Cavalry Field, three miles east of the main park. This secluded area, which in the summer can be visited with a ranger guided tour once per week, was the site of the main cavalry battle at Gettysburg. It occurred during the cannonade prior to Pickett's Charge and prevented Stuart from either attacking the Union supply trains and diverting attention from Pickett's Charge or even meeting the rear of Pickett's Charge to cut the Union line in two and changing the outcome from Union to Confederate victory. This point is debated in Civil War circles, but beginning to get more light shined on it. New research on the subject show roads which Stuart intended to take to circumvent the rear of Union lines and a new documentary, "The Horses of Gettysburg," will add to the debate. The preservation fight surrounding Gettysburg, which now includes 8,000 to 20,000 new homes in the area east and north of Gettysburg, would impact the East Cavalry Field more than any other section. Go there today, then come back and join the fight to protect this important battlefield. 5. 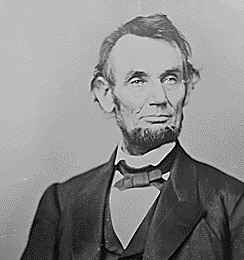 Take time to visit Gettysburg during the Remembrance Weekend and Dedication Day around the weekend and day of November 19, the date of Abraham Lincoln's Gettysburg Address. 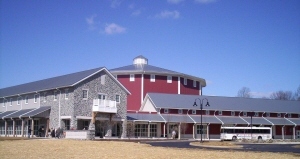 The Gettysburg Visitor Center & Museum, including the new film, A New Birth of Freedom, Exhibits, and Visitor Orientation. Ranger guided walks around the entire battlefield (free of charge), the schedule of walks from mid-June to mid-August is long and varied, with fewer during the off peak season. 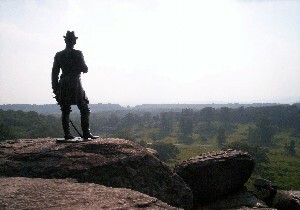 Photo Below: Warren statue on Little Round Top. Great Walk to take. Double decker bus tours, licensed battlefield guides that will take you on a private tour inside your own car, and horseback rides around the battlefield. Outside the Park: Ghost tours, town walks, Civil War theatre, a variety of museums from the American Civil War Museum to the Lincoln Train Museum, plus an IMAX experience. Beyond the park visitor center, there are almost a dozen private museums in Gettysburg, many along the Steinwehr Avenue corridor. These include the fine Gettysburg History Center, including the Diorama of the entire battle in miniature and its light and sound show. For more info, go to the Gettysburg Diorama. Another small addition to the landscape of Gettysburg museums is the privately run Gettysburg Museum of History. It's compact, it's free, and wonderful. Wandering downtown Gettysburg with your kids and want a great place to get them interested in history with a twist, stop by Civil War Tails at the Homestead. It's so unique and child friendly, you're not gonna believe it. There's changes at what used to be the Gettysburg Wax Museum now rebranded the Gettysburg Heritage Center, a restoration at Ziegler's Grove, and the new landscape coming around Lee's Headquarters. Check out our Gettysburg Next 150 article on this and a couple of changes, including the ongoing changes to the Ziegler's Grove area of the Gettysburg landscape. 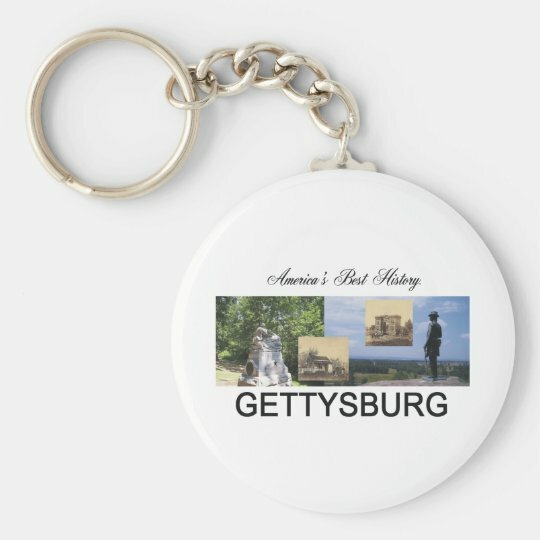 Although Gettysburg is a relatively small town, it is geared toward providing a great experience to Civil War tourists, perhaps more than any other site. There are bed and breakfasts, motels, hotels, and campgrounds that should suit everybody's needs. If you want the motel experience, we're partial to the area around the old visitor center location on Steinwehr Avenue. This location is within walking distance of Pickett's Charge, the High Water Mark, the National Cemetery, and the myriad of private museums from the Battle Theatre to the Hall of Presidents and First Ladies. With the new trolley service, you'll be able to travel down to the new visitor center and museum, plus downtown from this location. 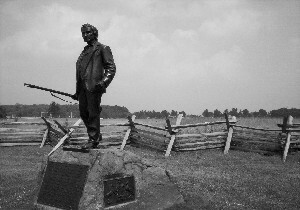 Statue of John Burns on McPherson Ridge, Gettysburg, the only citizen to fight in the battle. John Burns would personally meet Abraham Lincoln on November 19, 1863. 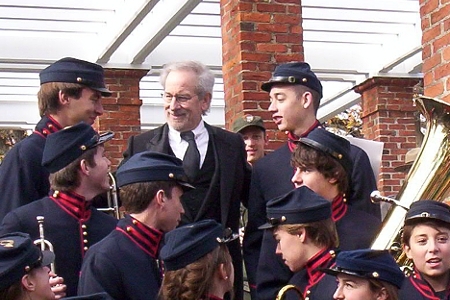 Keynote speaker Steven Spielberg, director of the movie Lincoln at Gettysburg Dedication Day on November 19, 2012. Gettysburg T-Shirts and Souvenirs. Official gifts from Americabesthistory.com provided at Teepossible. © 2019 Americasbesthistory.com & its licensors. Template by w3layouts.